Government initiatives to help the farmers resulted in the sustained growth of the state economy with attendant creation of jobs, wealth and food security. Osun State farmers and stakeholders gathered recently to discuss the way forward on agricultural development aimed at efficient food production and security. The move was to boost the state’s economy through agriculture and increase capacity for poverty alleviation. The event, tagged: “Osun Alagbinla” was designed to engage the stakeholders in educating the farmers on the basic proactive measures they need to take in ensuring adequate food production and security. It was also intended to commend farmers for their laudable contributions to the agricultural economy of the state. It was organised by the Office of Economic Development and Partnerships (OEDP) and Ministry of Agriculture and Food Security in collaboration with All Farmers Association of Nigeria (AFAN). The event took place at the International Institute of Tropical Agriculture (IITA) Research and Training Farm, Ago-Owu, in Ayedaade Local Government. 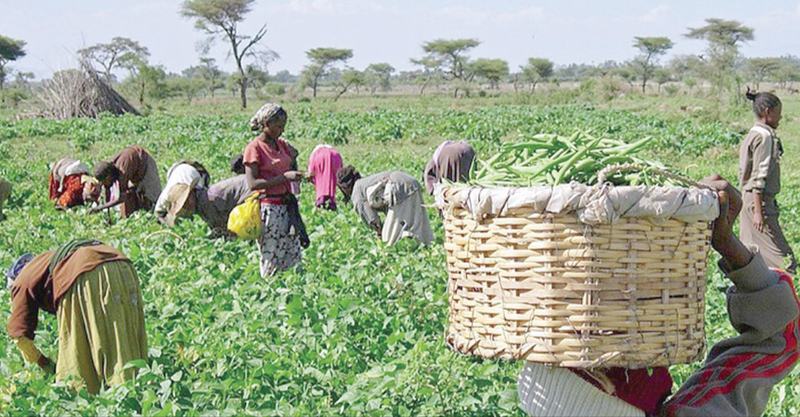 The stakeholders unveiled different blueprints aimed at improving the agricultural values with a view to galvanising support for farmers for more commitments to farming activities. Director General of OEDP, Dr. Charles Akinola, represented by the Coordinating Director in the Ministry of Agriculture, Dr. Olubukola Aluko, told the farmers: “The state government will consolidate on the agricultural land expansion programme with additional target of 20,000 hectares for farm settlements in each of its federal constituencies to encourage and boost agriculture in the state. Akinola added that the farm settlements in the urban centres would incorporate Green House and vertical farming for growing vegetables, chillies, pepper and others. Government also assured the farmers of adequate support to enhance agriculture value chain in order to ensure food production and security. Governor Gboyega Oyetola represented by his deputy, Mr. Benedict Alabi, said government had been supporting farmers through various innovative interventions with a view to making Osun the main hub of agriculture in the South West. He lauded the enthusiasm with which farmers embraced the strategic partnership between government and IITA. He said one of the programmes was the implementation of Osun Rural Enterprise and Agricultural Programme (OREAP) through which some innovative initiatives had been implemented. He claimed that farmers in the state had been enjoying access to agricultural loans, roads, fertilizer, support services among others through the government/farmer-friendly initiatives. Oyetola said the government initiatives to help the farmers had resulted in the sustained growth of the state economy with attendant creation of jobs and wealth as well as enhanced food security. He said some of the initiatives included the implementation of the private sector-led Farm Input Supply programme, the establishment of the Osun Agricultural Land Holding Authority (the Land Bank), the revitalization of all the existing farm settlements in the state, massive construction of Farm-to-Market Roads in different parts of the state under the Rural Access Mobility Projects (RAMP) and Osun Broilers Outgrowers Production Scheme (O’BOPS). A farmer, Mrs. Christiana Ogunsanya, lamented poor motivation: “Farming is a very challenging business especially for the women folks. That is why we need adequate motivation to do more. It is difficult to go to banks and get loans because they will ask for collateral and give different conditions that are difficult to meet. “We want government to assist us with interest-free loans through micro credit and finance banks to be able to buy good seeds, farm implements and to pay for transport to convey our farm produce to the markets in towns within Osun State and the neighbouring towns. To be able to embark on mechanised farming we need funds to buy the tools, fertilizer and to pay for human resources that work on the farms. Another farmer, Mr. Moruf Babalola, said: “The Fulani herdsmen problem is discouraging. When they take their cattle to some farms where there are no green grasses, they harvest cassava and yams for them to eat just like that. They take them to maize and vegetable farms where they graze on the produce. This is very painful because we lose a lot and if you dare complain, they attack you. “Government needs to find a way of helping us by discouraging this. Government has to provide security on the farms if farmers must continue to engage in the farming activities in the interest of the campaign for food production and security. “If the Fulani herdsmen challenges continue like this it will be difficult to achieve the food production and security purpose. Mr. Abidemi Deremi lamented the non-availability of network service in the farm settlements: “We have our families in the towns and whenever we are in the farm, we cannot communicate with our relations because there is no GSM network in the farms. The produce buyers would want to call us before coming to the farms, but they can’t reach us and this usually creates communication gap to the extent that in most cases, we miss good businesses as a result of non-availability of GSM network. Manager of the Bank of Industry (BoI), Mr. Isacc Faniyi Ojo, while speaking on providing financial support for the farmers, commended those that have refunded the loans that they took initially to enable another set of farmers to get loans. Head, Administration and Commercial Services Department, Osun Agric Land Bank (OALB), Mr. Wole Ajewole, explained the operations of the establishment and urged famers to key into them to enable government actualise its plans for them. He disclosed that the OALB had been searching for lands in all the nooks and crannies of the state for the new farm settlements. He, however, called for the support of farmers and stakeholders in the agriculture sector in the state for the successful implementation of the programmes of government for the benefit of the farmers.